As we look back on 2017, what really stands out is how corporate volunteerism is the engine that really helps St. Francis Food Pantries and Shelters work. While we at #StFFP can organize the events, provide the food, identify and include the clients in need, it's the volunteers from the organizations we work with that truly step forward to make our fundraising, food preparation and distribution events happen. And just as importantly, our volunteers make our community-focused events into fun social events...so the people being served don't feel like they are getting a hand-out but are part of a community of people that care. Last November, we held our 18th Annual "Doodle for Hunger®" 2017 Celebrity Art Auction and Gala at Pier Sixty, Chelsea Piers. Presenting sponsors Margo and John Catsimatidis, actor/entertainer Joseph Piscopo, musical icon Tony Orlando, host Ernie Anastos, auctioneer Amy Papola and actor Tony Lo Bianco – as well as hundreds of guests – all helped raise crucial funds, as well as dozens of birds for our Turkey Drive, to benefit the clients who depend on us. Our holiday parties always bring together corporate volunteers and needy clients in fun and warm settings. The annual Macy's Giveback Party brought over 100 school children together for a holiday experience. 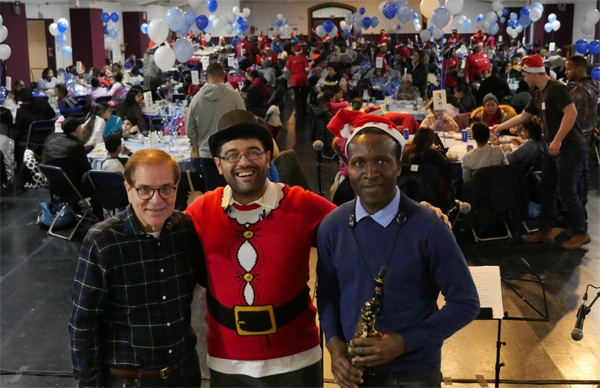 Our annual Holiday Celebration at St Paul the Apostle Church had almost 500 people in attendance. Con Edison's Knitting and Crocheting Circle prepared boxes of winter hats and scarves for the children. And none of these holiday parties would be possible without the help and support of all the volunteers that show up to make these events a reality. And we are always grateful to the individuals and companies who go the extra mile to host coat drives and more on our behalf. Such as Warburg’s Mary Anne Fusco, who’s been hosting an annual coat drive with StFFP for 17 years. And Steve Kaufman, president of The Kaufman Organization, who places large boxes in the lobbies of his commercial properties to collect coats and other winter accessories from those working in the buildings.